The Tasmanian Bushland Garden has been developed adjacent to the Tasman Highway near Buckland approximately 50 km north-east of Hobart. 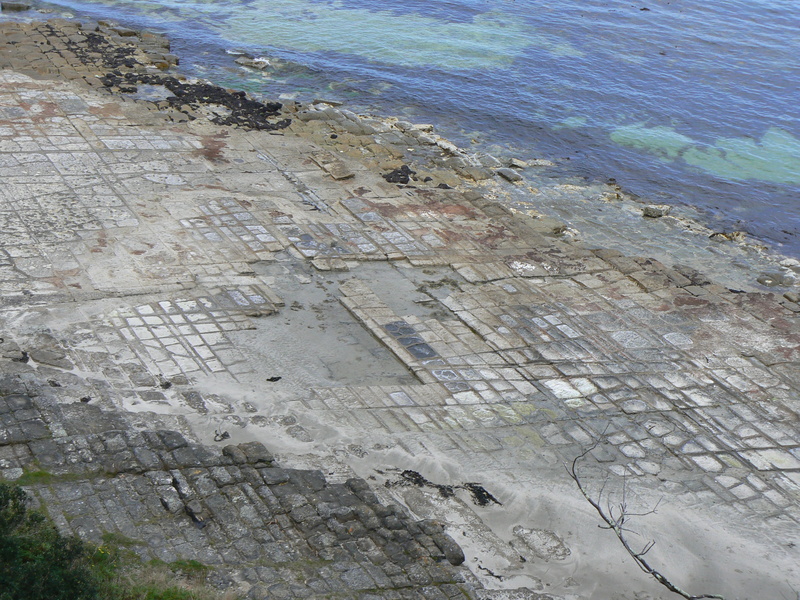 The 22 ha timbered dolerite hill had been degraded by grazing , firewood collection and a quarry when purchased in 2000. 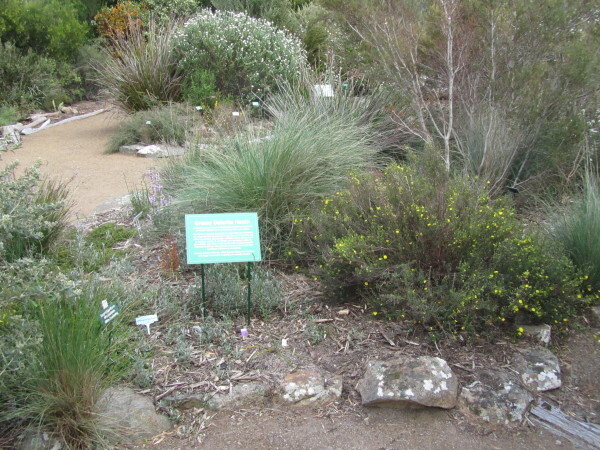 Over the next 10 years it was developed into a regional botanic garden to show case the native flora of south-east Tasmania. The garden opened to the public in 2010. The Display Gardens occupy about half a hectare, and have been developed on a gentle sunny slope facing SW. 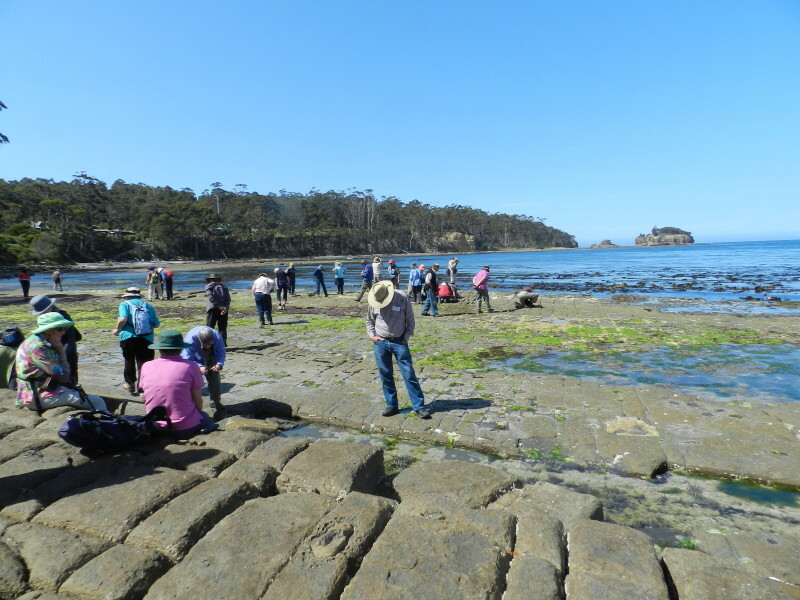 Display beds have been planted to simulate natural plant communities growing on dolerite in the south-east and some of the rare and plants of eastern Tasmania. The landscaping features many local rocks and logs, which give a natural setting, and the gardens merge into the surrounding grassy woodland. 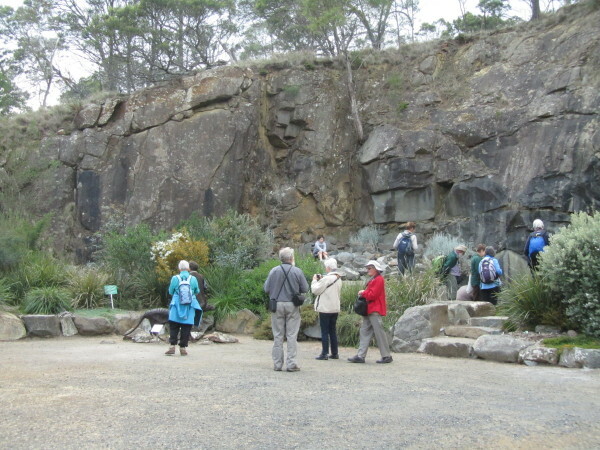 The quarry site has been transformed into a safe area with local fauna planted in a carefully designed scree slope, sculptures of Wedge-tailed Eagle, Tasmanian Tiger and dinosaur, a waterfall and vegetated pond. The leaders for this ANN excursion were Keith and Sib Corbett who were involved with the development of the garden. 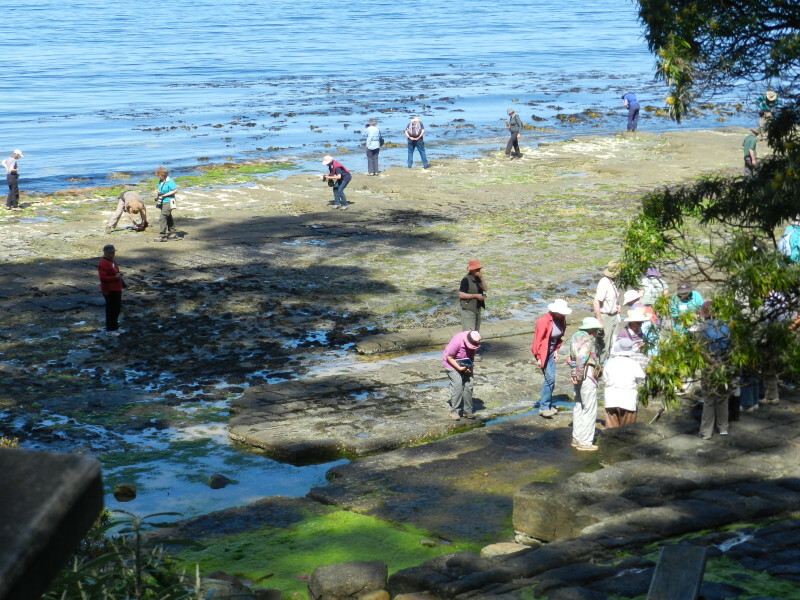 They gave us an excellent account of the transformation of the degraded area into beautiful area which informs the public and encourages the uses of the local flora in gardens. Grassy Dolerite Heath community with Tussock Grasses Poa sp. and Guineaflowers Hibbertia sp. The Styx Valley Big Tree Reserve is near Maydena 100km north-west of Hobart. 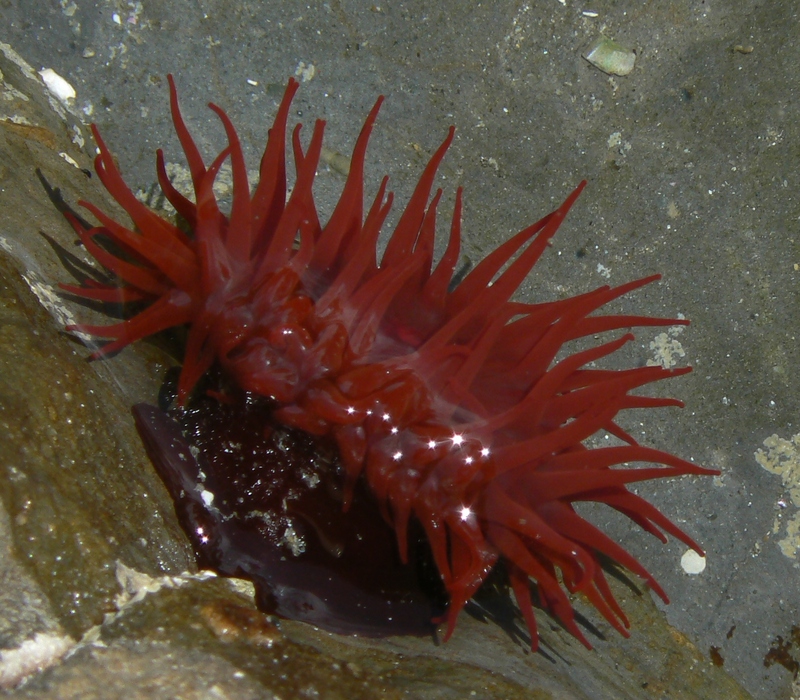 The reserve is adjacent to the Tasmanian Wilderness World Heritage Site. The area of wet eucalypt forest has been reserved to protect the world’s tallest flowering plants Eucalyptus regnans. 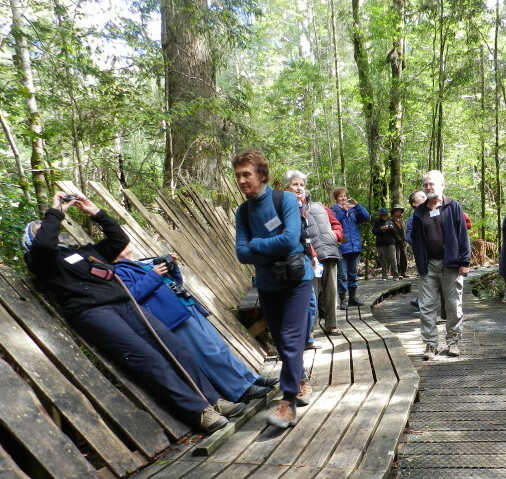 A boardwalk has been constructed through the forest. Little light penetrates to ground level which is carpeted by mosses, lichens and Soft Tree Fern Dicksonia antarctica. The middle layer trees include Southern Sassafras Atherosperma moschatum and Myrtle Beech Nothofagus cunninghamii. Towering above are Mountain Ash Eucalyptus regnans believed to be 400 years old and growing to a height of nearly 90 metres. 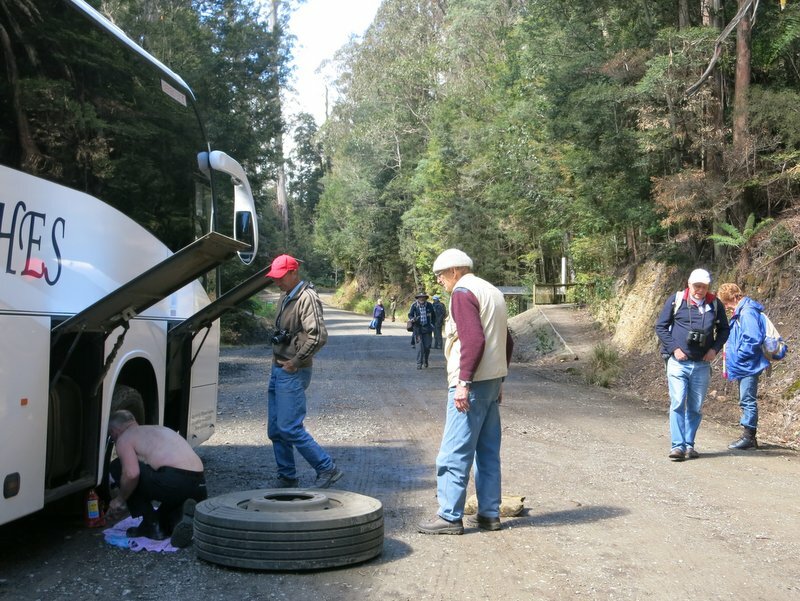 Lunch was extended because of a flat, front tyre on the bus. We had extra time in bright sunshine on the banks of Styx River. 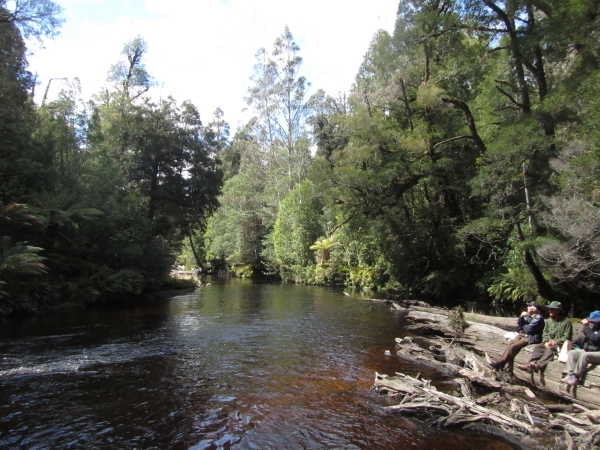 The vegetation along the river is rainforest dominated by Myrtle Beech. 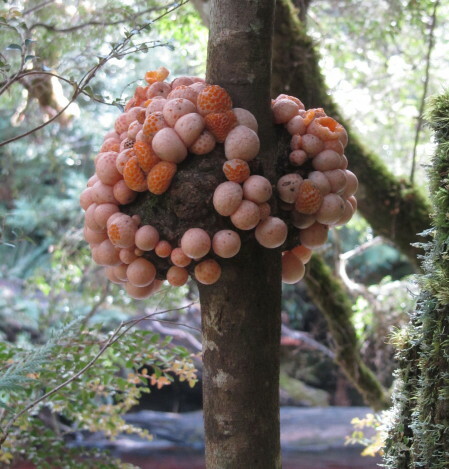 Myrtle Orange Fungus Cyttaria gunni grows only on Myrtle Beech and is a traditional Aboriginal food. The endemic Tasmanian Thornbill was seen near the river. Group Photo of participants in ANN Get-together 2014 hosted by Tasmanian FNC in Hobart 18-26 October 2014. Field Naturalists from Alice Springs, Ararat & District, Ballarat, Bendigo, Canberra, Castlemaine, Central North, Dubbo, Canberra, Victoria, Geelong, Hamilton, King Island, Latrobe valley, Launceston, Queensland, Fassifern, Sale & District, Stanthorpe, Toodyay and WA NATS clubs attended. sights of Canberra; the last of Floriade; a bus tour of the Embassies. The Deep Space Communication centre at Tidbinbilla was inspiring as we viewed a Video of the tension of the recent Mars Landing and the latest photos of the planet. their DNA stored in a freezer. Caladenia and Donkey Orchids and Wax-lip Orchid. Occasionally Bulbine lilies and purple Indigofera shrubs were also seen. theatre, including a fascinating talk with audio on Lyrebirds. Grassy Woodland adjoining the northern residential suburbs of Canberra. help to recycle nutrients. Val Hocking was one person who saw a Bettong. occurring plants on the Camden River. Now a forest of several hundred have been planted and every second tree will be harvested to raise funds for the arboretum. The Get-Together concluded with a dinner at a TAFE training restaurant which included a few participants speaking on “Why I became a Naturalist”. 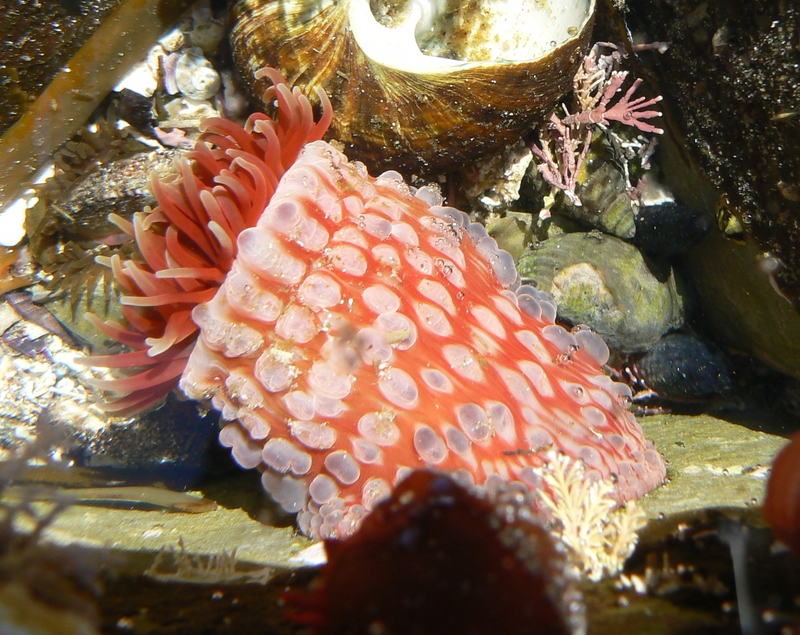 Naturalists were invited to ANN 2014 Get-Together which will be held in Hobart. ANN Get-Togethers are held during every even-numbered year. ANN Clubs receive information about the Get-Togethers and members of ANN clubs are welcome to attend. 2000 Inaugural ANN Get-Together was held at Alice Springs. 2002 Launceston Field Naturalists Club hosted Get-Together in northern Tasmania. 2004 Darling Range branch of the Western Australian Naturalists Club held the 2004 Get-Together based in Perth. 2006 South-eastern Australia Naturalists Association organised High Country Get-Together based at Harrietville (Vic) and Jindabyne (NSW). 2008 Northern Territory Field Naturalists Club arranged Get-Together in the Top End held at Mary River. 2010 Chinchilla Field Naturalists Club hosted Get-Together in the Western Downs region of Queensland. 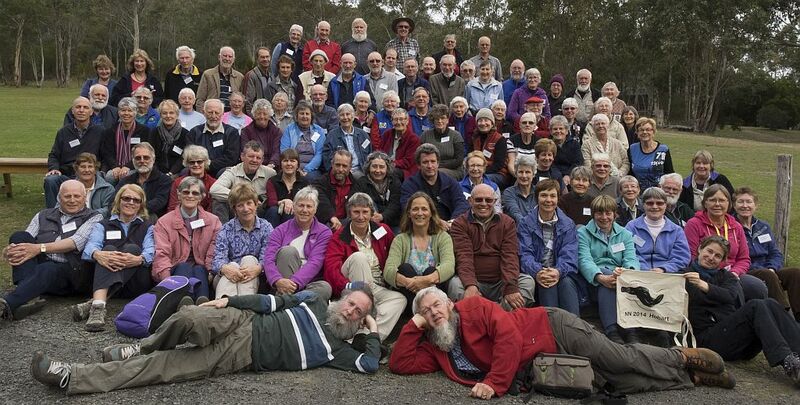 2012 Field Naturalists Association of Canberra hosted Get-Together in the national capital. 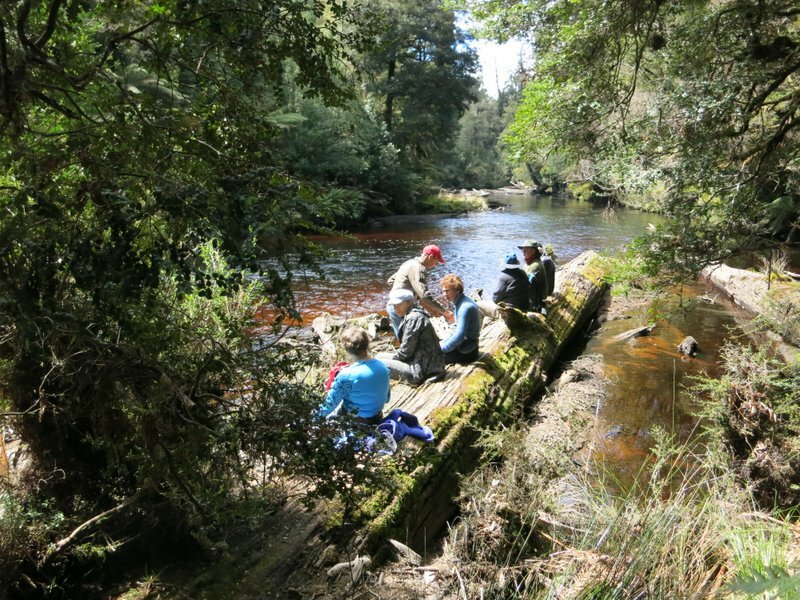 2014 Tasmanian Field Naturalists Club hosted the Get-Together at The Lea, near Hobart, 18-26 October 2014. 2016 WA Nats hosted 9th ANN Get-Together at Woodman Point, Perth, 1 – 10 October 2016. 2018 South East Australian Naturalists Association hosted the 10th ANN Get-together at Halls Gap, Warrnambool and Anglesea, 29 September -8 October 2018. 2020 Stanthorpe Field Naturalists Club will host the 11th ANN Get-together in spring.